Bánh mì is Vietnamese for “sandwich,” more or less. There are scads of different varieties, all of which have their own name I would doubtlessly butcher in trying to pronounce. This is a fairly small problem, though, as the vast majority of Vietnamese sandwich shops are kind enough to display names in English as well as Vietnamese. The problem is that the categories the sandwiches are slotted into are too wide. Bánh mì thịt nướng is my preferred sandwich, the one featured at the top as The Finest Sandwich, and the one I am forever searching for. But that gets translated most frequently as BBQ Pork or Grilled Pork, and within those categories there are numerous variations in both recipe and cut of meat. I’m very rarely disappointed, but excepting The Finest Sandwich, I never find quite what I’m looking for. And that’s how it was at Cam Hung. This was a tasty sandwich, don’t get me wrong, but the thin slices of pork were a far cry from the substantial, chewy pieces I had hoped for. The roll could have been a bit crustier though, but that’s as far as my complaining can go. This was a fine sandwich, with the wonderful flavor I so love. The marinade brings a savory base, with layers of garlic and fish sauce, in between which plays a distinct sweetness. A healthy portion of jalapeño on top covers the heat nicely, and carrots and daikon radish brought a nice contrast to the soft pork. 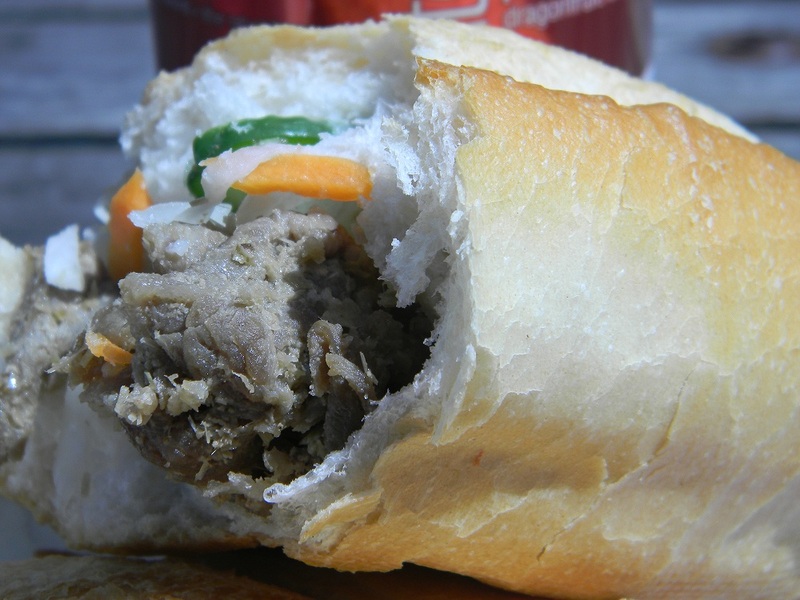 Inherent uncertainty aside, ordering a pork bánh mì rarely goes wrong, and this time was no exception. Fish sauce with a pork filling? Is this a common thing? It sounds all wrong on paper, but not having experienced it I’m in no position to know. The fish sauce is but one part of a larger marinade, usually some combination of garlic, soy, fish sauce, sesame oil, black pepper, and a bit of sweetness. It’s heavenly, Jon. Heavenly.